In August 1996 Tamara Puffer was a young, newly married violinist-turned-pastor serving a large suburban church. Her growing work with people living on Atlanta’s streets was beginning to reshape her theology and her calling, but a serious car accident derailed her carefully planned career path. 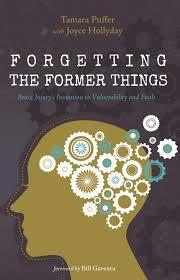 Forgetting the Former Things is a rare tapestry of first-person faith journey woven with gritty theological reflection and persistent hope. She finds solace in the stories of biblical women as she also wrestles with negative images of disability in scripture. She embraces her self-described role as a “minister of vulnerability” in this troubling national moment—as jobs, healthcare, and affordable housing are evaporating for so many, as countless people feel terrorized by discrimination or the threat of deportation—boldly casting her lot with others whose marginalization cuts deeper. Joyce Hollyday is the author of several books, including Clothed with the Sun: Biblical Women, Social Justice, and Us, and is a pastor serving immigrant women in Madison County.